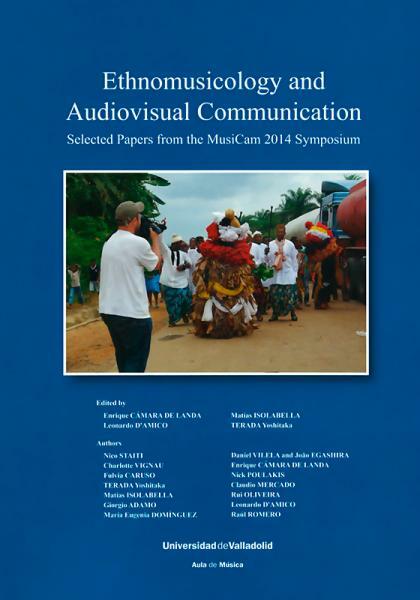 This book contains fourteen articles based on the presentations during the MusiCam 2014 symposium organized by the audemars piguet Aula de Musica of the University of Valladolid (Spain), where scholars and filmmakers from eleven countries presented nineteen papers. The articles are divided into six groups: 1. Theory and Methodology (Nico Staiti, Charlotte Vignau, Fulvia Caruso); 2. Ethics and Representation (Terada Yoshitaka, Matías Isolabella); 3. Analysis (Giorgio Adamo, María Eugenia Domínguez, Daniel Vilela and João Egashira); 4. Education (Enrique Cámara de Landa, Nick Poulakis); 5. Fieldwork Footage (Claudio Mercado, Rui Oliveira) and 6. TV Documentaries (Leonardo D'Amico, Raúl Romero). The book, covering such a wide range of themes and issues, is intended to benefit anyone interested in the interface between audiovisual media and ethnomusicology.